WILLOW CREEK BIGFOOT HOT SPOTS! With the procrastinated tax season upon us, not to mention our kid out of school on Spring break, we have had little time for blogging lately. Bigfoot, however, has still been hot on our trail. Somehow we just can't avoid the Big Hairy Guy. We've received interesting emails from Peter Byrne, John Green, and others who appreciated our HOOPA PROJECT Book Review last week. Also, a source on Bluff Creek history, who wishes for now to remain anonymous, has contacted us and we had a VERY interesting and revealing four hour long conversation at the shop. We had a nice visit from BFRO investigator and author, Ranger Robert Leiterman, too (see below for some of his interesting video links). With the Bluff Creek basin still closed to public access for the season, this kind of thing keeps us going, for sure. This week you'll find a Bigfoot odds-and-ends with a decidedly Willow Creek focus. This is how we intended our blog to operate at its conception; however, larger global issues of Sasquatchery often have overwhelmed our intention to stay local. 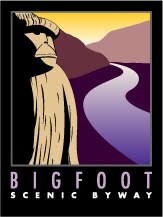 Planning a trip to Willow Creek and Bigfoot Country this summer or in the future? 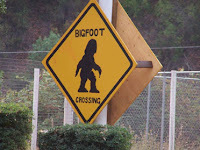 Check out the listing below of all of the Bigfoot hotspots. No, we don't mean actual sightings, but rather those encounters of a more cultural and infrastructural variety. 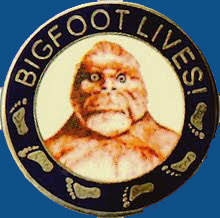 All of this is covered more in-depth, though not as up-to-date, on our older BIGFOOT BY THE ROADSIDE website. Check it out! 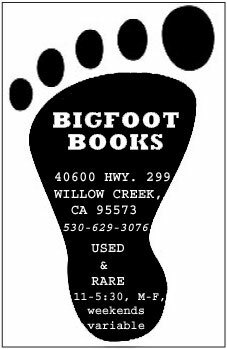 This week AL HODGSON, famous Willow Creek Bigfoot Elder (see our three-part interview with him by clicking his name, above), came in to the BIGFOOT BOOKS shop for a visit. He's always in a bit of a hurry to get back and care for his wife, but he managed to spread more Bigfoot good will. 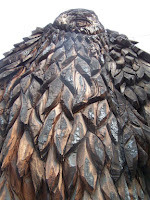 He left us with an absolutely fabulous redwood BIGFOOT SCULPTURE. This was made back in the day by someone in Crescent City, but Al could not recall the guy's name. Apparently they were meant to be put out onto the market, but never made it. Now prominently on display at the shop, our BF stands about 20 inches tall, and is damned proud of it. 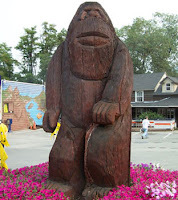 Images: The Al Hodgson-gifted Bigfoot statue, on the back porch at Bigfoot Books, Willow Creek. Photos, Steven Streufert. CLICK ALL IMAGES TO VIEW ENLARGED FOR DETAIL. 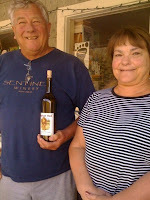 Before that we had a very nice visit from Bruce and Janet of the SENTINEL WINERY, makers of the tasty BIGFOOT RED WINE. We found out that Cinnabar Sam's Restaurant in Willow Creek is no longer the exclusive distributor of this higher quality general table wine. Selling for $20.00 at Sam's can make it a bit steep for everyday, non-dining usage; but they assured us the wine can now be found more cheaply in the $14.00 and under range at the regional grocers, Ray's (with an affiliate in the former Bob's Market location in Willow Creek, and in Hoopa) and Murphy's. Also, you might want to drop in and visit the winery in our fine town for a visit and tasting. It is located up past the US Post Office, over the hill on Country Club Road, past Kimtu Park turnoff, and then to the left on Patterson Road after the bridge over the Trinity River. "Sentinel Winery was founded in spring of 2006 by Bruce and Janet Nelson. The 2-acre Covey Lane Vineyards and the winery are both located on the Nelson’s estate one-half mile from the Trinity River near the Trinity Alps Mountains in Willow Creek. All grapes used in making the wines are grown in the Willow Creek Viticulture Area and all wines are estate bottled. Bruce and Janet Neslon invite you to call for an appointment for a private barrel tasting and a visit with them on their wonderful front porch." Image: The faces behind Bigfoot Red, on the front porch at Bigfoot Books, Willow Creek. Photo, Steven Streufert. Speaking of CINNABAR SAM'S (read another set of reviews HERE), famous for its historical-themed interior and hearty pre- or post-Bigfoot field research meals: the business is up for sale. However, it remains open for hearty, mountain-style family dining. If you know of anyone interested in purchasing the building and taking over the business pass on the word. The owner, Steve Paine, is a font of knowledge of local history, and has shown a few Bigfoot-themed aspects in his business decor over the years. 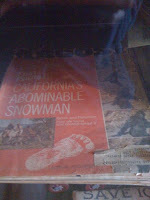 Images: The Bigfoot Country banner once displayed on the front rail of Cinnabar Sam's. Also, the elusive ARGOSY on display. Photos by Steven Streufert. In the glass case at the entranceway to the host and cashier counter be sure to see an original February 1968 ARGOSY MAGAZINE, with the exclusive first publication of photos from the PATTERSON-GIMLIN FILM, and an article inside by Ivan Sanderson. 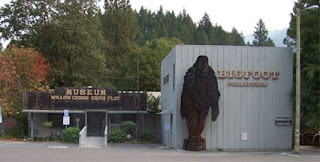 The prime Bigfoot destination in the town of Willow Creek is, of course, the WILLOW CREEK-CHINA FLAT MUSEUM, with its BIGFOOT COLLECTION add-on building. 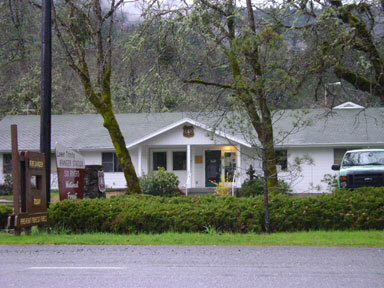 Al Hodgson was intstrumental in the founding and maintenance of this fine little museum, and along with John Green helped set up a wing to house one of the finest collections of Bigfoot footprint casts in the world, inherited from early researcher, Bob Titmus. There are wonderful historical displays on Bigfoot History in the general Klamath-Trinity area, including the PGF and the Jerry Crew footprint finds of 1958. Closed duing much of the off-season, the Museum is open most days during the summer. It covers local history, culture and wildlife in one wing, and Bigfoot in another. They have a good selection of Bigfoot knick-knacks to purchase in the gift shop area. Also of interest is the LOG BOOK at the entranceway, which is chock full of visitors' Bigfoot sightings and encounters. Check it out. Right down from the Museum and the Mexican restaurant one will find the JIM MCCLARIN OH-MAH BIGFOOT STATUE. This is the one, the famous and historical redwood carving that was in progress and nearing completion at the time the famous Bluff Creek Bigfoot film was shot. It is also just down the street from where Roger Patterson called Al Hodgson to announce the good news. This statue traditionally guards the entrance to Bigfoot Country at the junction of Highway 299 and the BIGFOOT SCENIC BYWAY, Highway 96, which leads up through Hoopa into the Bluff Creek area (see MAP below). Drive the highway north until you get to Happy Camp, CA, and you'll have traversed the richest zone of Bigfoot history in the world, in our own humble opinion. Stop in Orleans to get into the PGF zone (go up Eyesee Road about 16 miles then turn left on 12N13), or stop at the mouth of Bluff Creek, at the bridge where it flows into the Klamath River for a dip in the water and some great views. The statue sits just outside of the Willow Creek CHAMBER OF COMMERCE's Visitor Information Center. There are brochures here, some maps, and during open hours a helpful local elder who can tell you more than you know how to ask about the area around here. Images: Save for Byway logo, by Steven Streufert. CLICK TO ENLARGE to view. 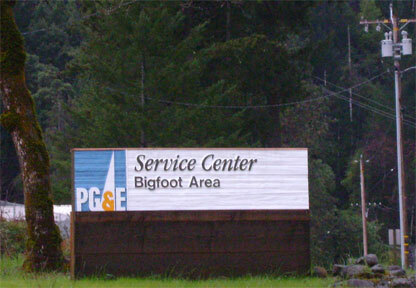 A little ways eastward on the 299 and one will find another Bigfoot Mecca, here at PATRIOT GAS STATION. 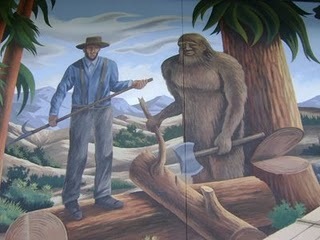 There is a fine and amusing mural done by Parrish Signs and large Bigfoot statue on display. Just don't climb on the Big Guy's feet! They are slowly crumbling to bits under the weight of gawkers posing for photographs with The Creature. They used to sell Bigfoot novelties here, but have since moved on to more profitable beer, liquor, tobacco, snacks and lottery tickets, not to mention hookahs and CIA ball caps. It's still a great place to get your picture taken with Bigfoot. Images: Above and below, save for the map, photographed by Steven Streufert, 2005-2010. 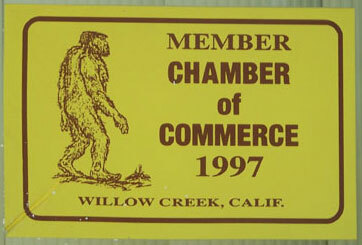 Just driving around Willow Creek will reveal Bigfoot-related sightings everywhere. 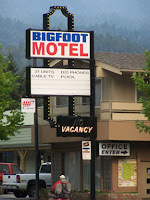 Head down the 96 and you'll see a Bigfoot Crossing sign at the WILLOW CREEK MOTEL. There is another one in front of the BIFOOOT MOTEL on the 299. Both of these are, of course, good stopping places for much needed Bigfooting rest. If you stay at the Bigfoot Motel you might just be sleeping in the very room where the Pacific Northwest Expedition was founded and had its original meetings involving Titmus, John Green, Rene Dahinden, and Tom Slick himself. Be sure to check out the BIGFOOT CAGE located in the back by the pool. Hilarious!The Willow Creek Motel has a BIGFOOT'S DEN in the fenced-in yard, but we have yet to find out what is housed in there. 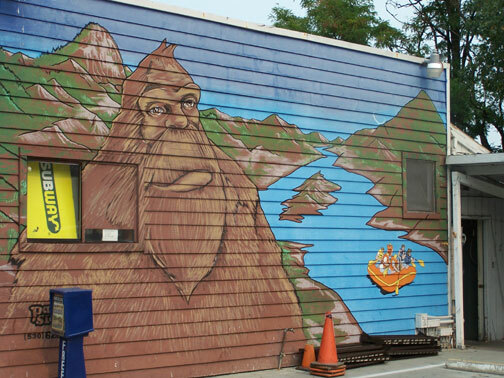 Just across the street from Cinnabar's you'll see a large full-wall BIGFOOT MURAL on the ACE HARDWARE building. It is huge. See the long, narrow image in the upper banner of this blog--just click it to see our photo montage of artist DUANE FLATMO's creation. The theme is "Bigfoot in the Community," with the creature helping out with local trades and industries in five different locations along the wall. This is one you can't miss, and you might just learn something about the REAL history of the little hamlet of Willow Creek. Go over Country Club Road and the Trinity River Bridge, then left on Patterson Road, and you will come soon enough to the BIGFOOT SUBDIVISION, near the golf course. There you will See BIGFOOT AVENUE and its companion, LITTLE FOOT COURT. The WILLOW CREEK GOLF AND COUNTRY CLUB there used to be named after Bigfoot, but they changed it for some unknown and un-Squatchly reason. Drive east from downtown Willow Creek about one and a half miles and you will come to our own shop, BIGFOOT BOOKS, which of course has many Bigfoot books (over 100 titles for sale at this point) and knick-knacks, as well as yours truly sitting at the desk probably blogging and internet bigfooting rather than actually getting any work done on the books. Besides Bigfoot, we have a full building stuffed to the rafters with used books in all subject areas. 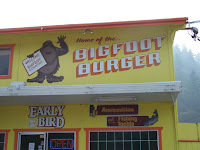 Just next door to our lot one may take repast at THE EARLY BIRD, a basic fast food and take out pizza restaurant, and home to the world famous BIGFOOT BURGER. The sandwich has two patties inside of a foot-shaped bun, and is normally too big for the appetites of the non Bigfoot-sized customer--we heard there is a half a pound of beef used in each one. 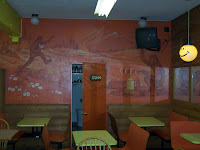 Inside the big bright yellow building one may view one of the cutest and silliest pieces of Bigfoot art out there in the mural on the back wall: Bigfoot romance, with donuts and coffee roasting over the campfire! They also have a snack market and a nice selection of fishing poles, reels, bait and tackle. The bake-at-home pizzas they make are quite good, too. 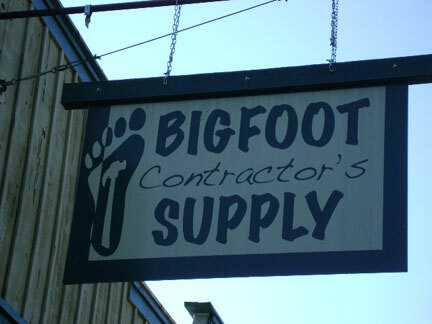 Go farther down the 299 to the east and you'll come to BIGFOOT CONTRACTOR SUPPLY, another hardware store but with a builder's emphasis. 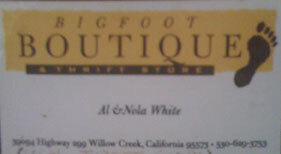 They have a small shelf behind the counter of Bigfoot gift goodies, from shot glasses to t-shirts, most of them from the Bishop company line. Even PACIFIC GAS AND ELECTRIC (PGE) gets in on the fun. 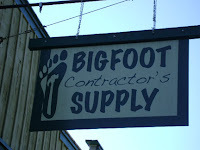 The sign near their electrical service center, just off Highway 96 outside of town, reads "BIGFOOT AREA"
There is a small but nice thrift shop in town called BIGFOOT BOUTIQUE. They have a carefully selected choice of good, used goods, and very cool owners, too. 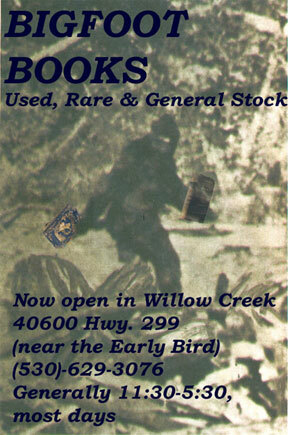 You're unlikely to find Bigfoot items in there, though, as we at Bigfoot Books have probably bought them all up! And let us not forget one of the major draws to Willow Creek: gonzo river rafting. 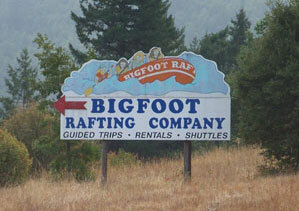 Outfitters used to abound around here, but now only the best remains: BIGFOOT RAFTING COMPANY. Give it a try, if you dare going through Hell Hole. The office is located right under the back deck of Cinnabar Sam's. And, last but not least, if you head northward on Highway 96 you will supposedly find BIGFOOT PODIATRY. Now, we don't know if this is just a long-standing joke, or if there really is a foot doctor out there, but if your feet ache after a long bigfooting hike maybe give this number a try. 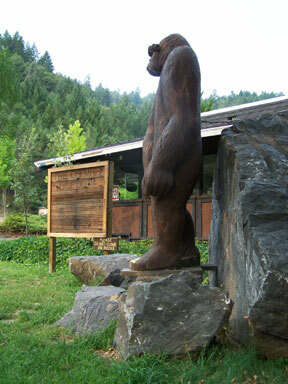 Image to right: The Al Hodgson Bigfoot cast from Bluff and Notice Creeks, in replica, here for size comparison at the foot of the Museum's giant redwood Bigfoot Statue. Photo and foot in Converse shoe by Steven Streufert. 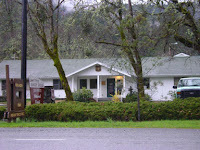 One should definitely go to the SIX RIVERS, LOWER TRINITY WILLOW CREEK RANGER STATION, also along the 96 just out of town. The ranger in there not only can tell you some good Bigfoot stories, but also has (if you ask--they are stashed away in the desk) the great Six Rivers Forest Atlas of topo maps for sale. 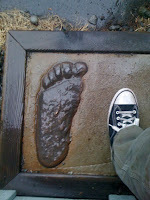 They are a bit expensive, but very useful indeed if you intend to go up into the Bluff Creek Bigfoot Zone. Get your fire permits here for free before you go, folks. Click the link here for an interactive MAP OF WILLOW CREEK on Google Maps. The map at left shows the Bigfoot Scenic Byway. Ranger Robert Leiterman, author of "Yeti or Not, Here We Come! 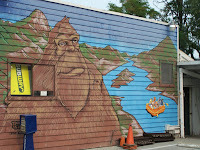 Bigfoot in the Redwoods," and other fine fictional Bigfoot books, visited us in the shop a few days ago. He has been making some good videos of Bigfoot field research and posting them on the BFRO VIDEOS section on YouTube. The videos linked below involved a visit Robert took with Bigfoot researcher and witness Bart Cutino to the location of his thermal nighttime sighting up in Washington. The re-enactment is quite interesting. You always drive around look at statue of me, painting of me, thing named after me. No hu-man ever bring Bigfoot beer! Ever bring me no Bigfoot Burger? Any hot hu-man fe-male ever ask me out on date? No way, Jo-se. Me sit and drink berry juice, gnaw salmon head, gulp deer gut. It no party out here for Bigfoot. Life hard when you wild and free. But at least me wild, free, not like slave hu-man on dumb vacation. 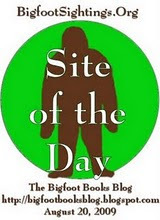 This blog and most photos on it copyright 2005-2010, Steven Streufert/Bigfoot Books. They may be used with citation and a kindly link to our site, preferably with email notice to us as well. Otherwise, go ahead and steal for non-profit purposes, ye filthy pirates! Arrrr! "Yes, I see by your website all of the "branding" in your community businesses. Of course, I imagine marijuana growing dwarfs it all!!! Ha ha. But seriously you have a great website there, will take me another week to get through it all." Hey l love this website , l am from Eureka but moved as a child and love Bigfoot. 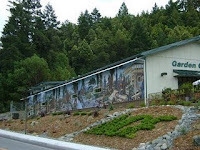 I just recently got to bring my family to California from Oklahoma we did not go to Willow Creek because l was told the Bigfoot MUSEUM was closed for the season . My my if l would have known that the town had this much to offer l would have been there in a heart beat . I know next time we will be stopping by to see you guys. Thank you so much for posting all these pictures! I used to live there when I was little so seeing all these got me all teary. Great work on discovering the PG Site, your videos are excellent and so informative. Looking forward to getting out to Willow Creek and your book shop. My son loved to watch the Travel channel and seen this area on there. We traveled all the way from southern california in the month of Feb a few years back to find out that it was the off season. 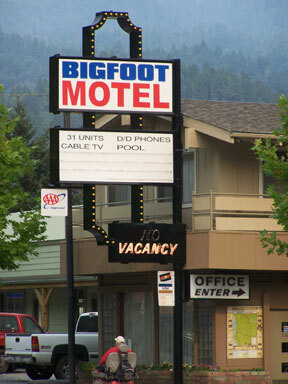 Wish the lady at the bigfoot motel would of been truthful. We do plan on coming back. Bigfoot is 1000% real, for anyone who questions it and thinks it's just folklore.